Geostationary satellites are stationed at approximately 22,300 miles (36,000 kilometres) from Earth and located directly over the equator. Given the equator is offset by 22.5 degrees, the sun aligns directly with satellites and receiving earth stations twice a year—once in the spring and once in the autumn. This event is called a sun outage and is also known as sun fade or sun transit. 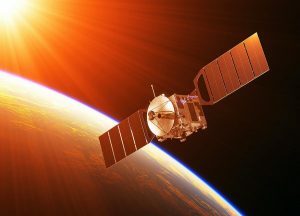 The heat emitted by the sun is an intense source of noise radiated at all frequencies, including the frequency range communication satellites use. That noise is called thermal noise. When the sun—and its thermal noise—aligns perfectly with a satellite and the receive antenna on the ground (line-of-sight), the noise floor, as seen by the receive earth station, is significant enough that it rises above the satellite’s carrier signal and causes a temporary loss of reception. 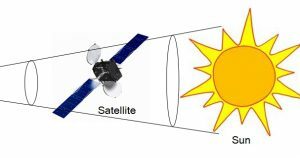 A sun outage occurs because the earth station cannot distinguish between the energy from the sun and its intended communication signal. The duration of the solar interference depends on the receive antenna’s location on the Earth, the satellite’s orbital location above the equator, the size of the receive antenna and the reception frequency. These sun outages start with a signal loss of only a few minutes. The outages start small—when the sun is very near alignment with the satellite and the earth station. The sun’s thermal energy is strong enough to temporarily interfere with the satellite signal and cause an outage as it approaches direct alignment. Each day as the sun moves further north, the sun’s alignment with the satellite and earth station move ever so slightly. 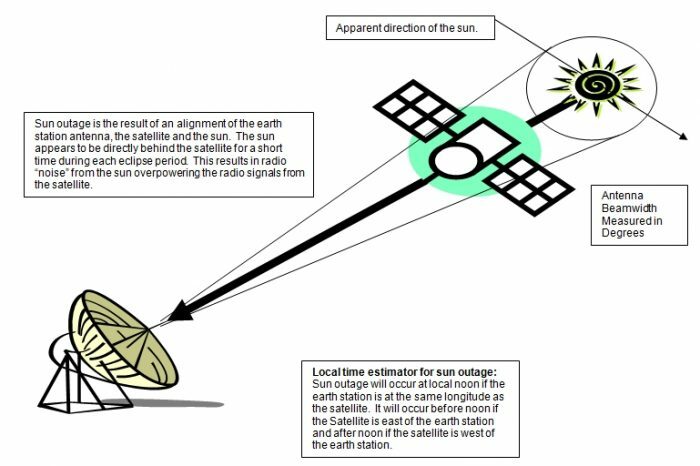 As the sun becomes more aligned with the satellite and the earth station on the ground, the outage duration increases. Peak outage time occurs when the sun, satellite and the earth station are exactly aligned with each other. The interference declines gradually as the sun starts moving away from the satellite and earth station alignment until it is no longer a factor—until the next interference season when the sun starts heading south (northern hemispheric in autumn). 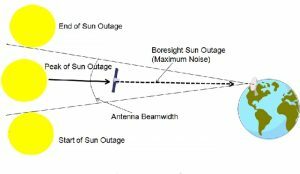 Given that all geostationary satellites are over the same geographic plane—the equator—and orbiting at the same distance, 22,300 miles or 36,000 kilometres, the sun outage will apply to every antenna at a given location. For instance, if there are four antennas looking at four different satellites (assuming the dishes are of the same size and same frequency reception), the solar outage will travel through all four satellites and antennas at that location in the same day. The four events will happen at different times of day for each satellite, as Earth’s rotation creates alignment. The duration of the outage is inversely related to the size and frequency of the satellite receive dish. The larger the antenna, the shorter the duration and intensity of the outage. Similarly, the smaller the dish, the great the duration and intensity. When do Sun outages occur? A sun outage typically occurs around the time of the equinoxes. This happens twice a year when a satellite and a receiving earth station come directly in line with the sun. In the northern hemisphere, sun outages occur before the March equinox (February, March) and after the September equinox (September and October), and in the southern hemisphere, the outages occur after the March equinox and before the September equinox. The sun radiates strongly across the entire spectrum, including the microwave frequencies used to communicate with satellites (C-band, Ku band, and Ka band). So the sun swamps the signal from the satellite. For geostationary satellites, the solar outage can typically cause disruption to the received signal for a few minutes each day for a few days. It will last longer the smaller the antenna involved. A smaller dish will have a longer period of interference than a larger dish. This is because a small dish has a greater signal acceptance angle than a big dish. How does it affect watching TV? The effects of a sun outage range from partial degradation (increase in the error rate) to total destruction of the signal. During this time interference may occur with picture quality and sound when watching television. Sun outages do not affect internet or phone service. Those parameters can be used to determine the outage angle of the receive antenna. 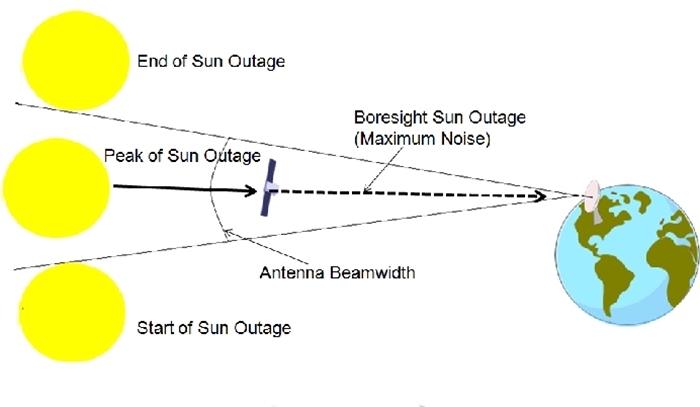 Outage angle is defined as the separation angle (measured from the ground station antenna) between the satellite and sun at the time when sun outage or signal degradation begins or ends. If you select a satellite and the ‘All Active E/S’ Analysis type, the calculator will use the Long-Range Planning Calculation. Otherwise, the Near-Term Projected Outage Calculation will be used. An integrated calculator which provides exact date and time of service outages caused by sun interference for teleports as well as for all connected remote sites.